The Porsche 911 is undergoing some changes once again, a trend that’ll very much continue with the upcoming 992 generation. 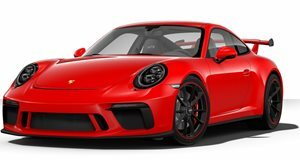 According to a report from Motor, for example, the next-generation 911 GT3 will likely drop its naturally aspirated flat-six for a turbocharged version, supposedly with around 550 hp. The current 911 GT is powered by a 4.0-liter flat-six with 500 hp. This same rumor suggests that an eight-speed PDK will be the gearbox of choice with no mention of a six-speed manual option. Because a turbocharged engine’s forced induction system adds weight, Porsche will need to utilize lightweight materials to offset some of the added poundage. An active aerodynamic system is also a possibility. News like this, of course, typically does not make 911 purists all too happy, especially since Porsche has made no secret its intentions to introduce hybrid technology to a future 911 variant. By 2023, if Porsche’s plan proceeds on schedule, a plug-in hybrid 911 will be ready to go. For the near future, however, the next-generation 992 911 is expected to debut later this year, most likely at Paris next September. Next month at Geneva, the updated 911 GT3 RS, images of which recently leaked, will have its official premiere. Before the 991 911 is discontinued, we also expect Porsche to unveil the limited edition retro-style Speedster variant, a tradition that began at the end of the 997’s production life. It’s possible, though still unconfirmed, it too will debut at Geneva.